There’s no program on my Mac that’s annoyed me more over the last year than Mail. Which is funny, because for years I held up that program as an example of Apple working to fix customers’ problems while Microsoft let Outlook Express decay. Searching for old messages was intolerably slow, to the point where it would be faster to grab my iPad, log into the relevant account and start the search… after first running up and down the stairs to find that tablet. 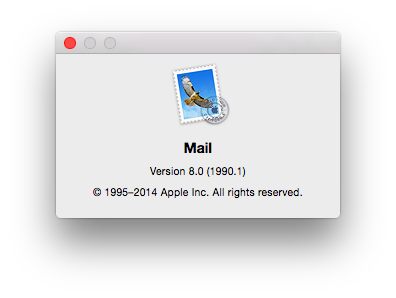 Switching back to Mail from other apps would leave the insertion point randomly shifted to a point months or years in the past–which, to be fair, is great for cheap nostalgia. Some mailboxes would be shown sorted by subject instead of date, never mind that sorting by subject is a total waste of time unless a mail client can’t handle search (ahem). More recently, Mail began forgetting the custom app passwords Google generates for mail clients and other apps that can’t process its two-step verification codes. Apple’s updates fixed some of these issues before OS X Yosemite. I don’t think I’ve seen a mailbox randomly sorted by subject in months, and I haven’t had to open Keychain Access to copy a saved Google app password back into Mail since last month. Yosemite, to judge from its performance on my MacBook Air, has also returned search in Mail to a state of good repair. I can only hope Apple keeps working on these other issues. Because between Web-mail’s issues with offline access and working with other apps and the lack of a compelling alternative client (understandable, given how many people rely on Web-mail or don’t spend as much time in a mail client as me), firing this app just doesn’t seem too practical. This entry was posted in How-to, Occupational hazards, Software and tagged Apple Mail, gmail, Mail.app, Mavericks, os x, OS X Mail, Yosemite by robpegoraro. Bookmark the permalink. I’ve been hearing rumors that iPhoto is going away.